It’s not unusual for guilt to set in after the death of a loved one or an acquaintance, even if it’s completely unfounded. We all want to be excused for what happened, to assure ourselves that nothing we did contributed to someone else’s tragedy. I should have been there, we say. I should have gotten to know him better. I should have been more compassionate. I shouldn’t have done that one thing that one time. Maybe if I’d behaved differently, the universe, or God, would have set different events in motion. This week’s episode of Broadchurch was all about how the past can rear its head during a crisis and transform grief into self-loathing. Mark Latimer blames himself for having an extra-marital affair the night of Danny’s murder. Beth struggles with the knowledge that she’s pregnant, presumably by someone other than her husband. Det. Hardy searches for the murderer with the guilt of a recent scandal hanging over his head. They’re all haunted by past transgressions and the possibility that Danny’s death “may be punishment for what we did,” refusing to let themselves be comforted out of a subconscious desire for judgment. Det. Hardy is the only one who seems to recognize this psychological pattern, though. 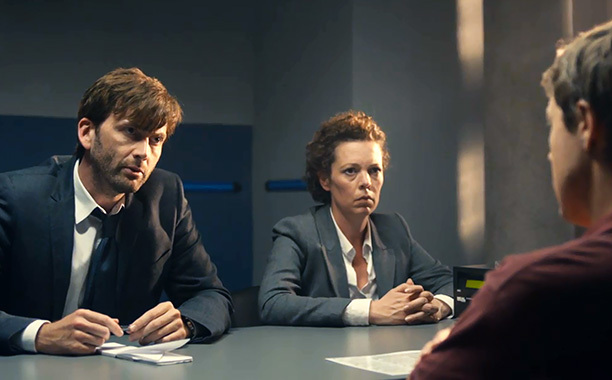 When asked why he stays in Broadchurch even though he clearly hates working there, he states it outright: “Penance.” Maybe if he tortures himself for a few months he can make up for whatever he did wrong during his last murder investigation. We also learn this episode that he’s got some sort of serious medical condition that could be aggravated by stress. Perhaps he feels so guilty that he subconsciously longs for death; maybe then the cosmic scales would be balanced. He isn’t the only one. Mark is so ashamed by his affair with Becca Fisher that he allows himself to be arrested and obstructs the investigation into Danny’s murder just to keep it secret. He hates himself so much that he meets with Becca again that evening, desperate to continue the affair. Is it because he desires comfort in the midst of tragedy, or because he wants to do something to further damn himself and potentially ruin his life? Like Detective Hardy, he’s reeling out of control, desperate for something to hang onto. It’s a shame he doesn’t reach out to his wife. Beth feels trapped in the house and is desperate for any sort of relief. Last week she found solace in the words of Rev. Coates (who checks in on her this episode—he’s such a nice guy) and this week she turns to self-proclaimed psychic Steve Connolly, despite the fact he’s practically stalking her. He appears to be mild-mannered and well-intentioned, but there’s something sinister about the way he weaves comfort and suspicions together, claiming that Danny doesn’t want her to worry but also that he was killed by someone she knows very well. Her marriage is in trouble, and likely to collapse under the weight of the trauma, especially if instead of helping each other they reinforce each other’s self-hatred. There may be a light at the end of the tunnel, however. In the funniest scene of the episode, Det. Miller invites Hardy over to her house for dinner, despite the fact he’s spent the entire day humiliating her and not trusting her judgment. Last week’s episode was about how social mores are often unsuitable for dealing with grief; this is one instance where the socially accepted idea of “what people do” may be the first step in building a healthier relationship. If Miller can help Hardy pull himself out of self-loathing, maybe there’s hope for everyone else. This is why Broadchurch continues to impress me. It began with a simple premise that’s been done a thousand times and is gradually turning our expectations on their head. The murder investigation isn’t the primary focus here, and for the past two episodes it’s been mainly left to simmer in the background. It was always obvious Mark Latimer was a red herring, not the real culprit, and rather than quickly move on the show spent an entire episode wallowing in why he chose to lie. This isn’t a police procedural as much as it’s a series about community and how individuals respond to trauma. I find myself wondering what a “satisfying” or “good” outcome could be. Even if Danny’s killer is caught, that won’t take away the pain or the confusion. That has to be lived through no matter what. Maybe, as with so many real-life murder cases, the killer will never be found. Does that render the grieving process completely pointless? So far, I’m finding these characters’ chaotic quests for comfort more meaningful than any verdict.